"The Double" is the 93rd Mandrake Sunday story. The story was written by Lee Falk and drawn by Phil Davis. Four years ago the people overthrew the dictatorship and elected Andros as president. Now Andros was ill and needed medical treatment in US. But the young democracy was unstable and people loyal to the old dictator tried to use the situation to make a coup. 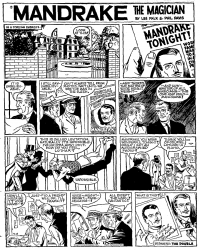 Mandrake stepped in as president Andros double and kept the situation stabile until Andros returned. Andros, president of a small far away European country. Max, ambassador in US and one of the conspirators. The story title is from the strip of September 8th, 1963 (Beginning: The Double). This page was last edited on 20 November 2014, at 19:35.